Coconut flour is very dense and filling. It's a great alternative for people who need to eat grain or gluten free. It also provides more complex and lower glycemic carbohydrates than traditional flour, which is great for people like me with diabetes. Cinnamon adds extra kick and flavor that a lot of lower sugar recipes need. Without all that extra sugar you're able to fully taste everything going on in a recipe, leaving your tastebuds fully satisfied. Medjool date paste is a great lower glycemic and completely natural way to keep dishes free of added sugar. It's a great substitute for honey and other concentrated liquid sweeteners. Avocado oil has many anti-inflammatory properties and is high in vitamin E. It's fairly flavorless and works great in baked goods. 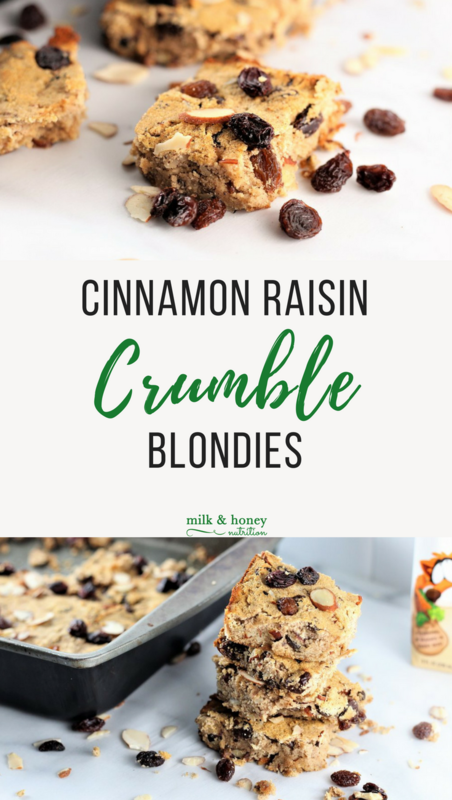 Sneakz Organic Milkshakes are my kids' favorite treat to ask for, so when they see me adding their favorite vanilla milkshake to these Cinnamon Raisin Crumble Blondies, it's pretty much guaranteed they'll want to eat them (#momwin). They're lower in sugar than traditional flavored milk options, and pack a full 1/2 serving of veggies in each shake! So what are you waiting for? Go make these! I promise you (and your kids!) will not be disappointed. Let me know what you think in the comments! This post was sponsored by Sneakz Organics. All thoughts and ideas are my own. Preheat your oven to 350 degrees. Grease a 8x8 baking pan. Combine the first five ingredients in a medium size mixing bowl and whisk to combine. In a separate bowl, combine the remaining ingredients except the raisins and almonds. Using a wooden spoon or spatula, mix dry and wet ingredients together. Gently stir in raisins and almonds. Gently press batter into your greased pan and flatten. Bake for 20 minutes or until edges are browned. Remove from the oven and let the pan cool on a wire rack until the blondies are at room temperature. Then place the pan in the refrigerator. Enjoy once they have had a chance to chill. *These hold together better if eaten cold or at room temperature. If you'd like to enjoy them warm, they make a great crumble topping for ice cream, yogurt, or toast! Bring water to a boil in a small saucepan on the stove. Add medjool dates and boil for 10 minutes. Remove the pan from the heat and let it cool to room temperature. Puree the medjool dates and 1/4 cup of the liquid left in the pan in your food processor or blender. Store in an air tight container for up to 2 weeks. Check out these other great low sugar dessert recipes!